Fresh off the heels of their #1 Software ranking on the Inc 500, SPARC contributes to Charleston’s local tech community with annual coding competition featuring 34 teams and over 4 million lines of code. Hackathon 3D Winners "App Life 3"
Hackathon lets app developers showcase their talents to their peers and community, and inspires the next generation of engineers to grow Charleston’s knowledge-based economy. SPARC successfully hosts its third annual Hackathon on August 23-24, 2013, bringing together Charleston’s local and regional technology community for a two-day coding competition. Hackathon 3D featured 34 teams and 84 contestants, with App Life 3 taking home the Best in Show award with their app Hyprmail. SPARC will host its 4th annual Hackathon in August 2014. 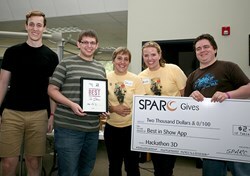 SPARC, who was recently named the 14th fastest-growing private company by Inc Magazine, hosted over 1000 people at its Daniel Island headquarters for Hackathon 3D. This included 34 teams, 84 contestants, 27 sponsors, and hundreds of spectators. Over the two-day, 16-hour coding period, contestants wrote over 4 million lines of code, producing some of the most creative apps the event has ever seen. "One of our core values at SPARC is ‘Participation’, and events like Hackathon 3D encourage our talented tech community to get involved, innovate, and have some fun with each other," said Eric Bowman, SPARC CEO. "Whether it’s CODEcamp, Dig South, or our own Hackathon, anywhere you find tech in Charleston you’ll find SPARC team members participating, contributing, and giving back to our thriving local scene." Hackathon features innovation and creativity at every level, from team names to apps. This year saw teams with names like Tyrannodroidus Rex, Appartica, theDroidsYou'reLookingFor, and The League of Pantless Gentlemen, who produced apps like Supernova Pop, Truckit, Beer Run, Halloo, and VisualMove. The judges narrowed the field to 10 finalists who then demo'd their apps to the crowd, then the crowd used SMS to vote for the winner. App Life 3 took home Best in Show with their app Hyprmail, which helps non-technical people create professional HTML emails. "Our growth, recognized by Inc 500 as the 14th fastest in the country, is attributed to the talented people that walk through our doors every day," Bowman added. "Hackathon lets app developers from around the community showcase their talents to their peers, and inspires the next generation of engineers to grow Charleston’s knowledge-based economy." 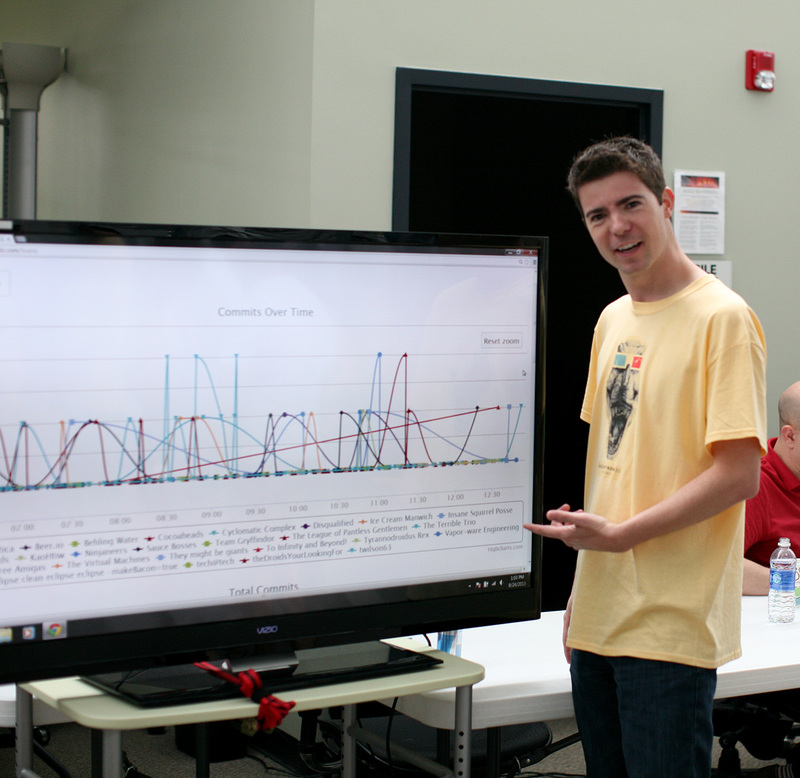 SPARC team members developed several custom apps used to manage the Hackathon. These include the tablet-based category chooser, GitHub code dashboard, and SMS voting tools. SPARC team members use technology to solve problems around the office on a regular basis, including a goal setting tool, annual review platform, and meeting room availability app. SPARC Ventures, the company’s internal innovation program, takes many of these tools to market, including Sparcet, Knappsack, and SuitedTo. Check out the SPARC blog for all the awards, finalists, and stats, and visit hackathon.sparcedge.com to sign-up for updates for Hackathon 2014. SPARC is a software product development company creating engaging, forward-thinking technology while putting customers, employees, partners, and the community first. With offices in Charleston, South Carolina and Washington, D.C., SPARC provides software development services for the government and commercial sectors, and develops commercial software products for the executive leadership, human resources, green energy, big data analytics, and mobile markets. Come by for a tour and see SPARC’s award-winning culture for yourself, or learn more at http://www.sparcedge.com.